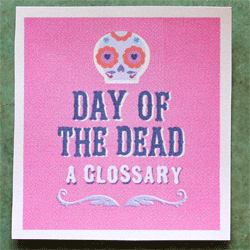 Day of the Dead glossary. Dia de los Muertos terms + traditions! 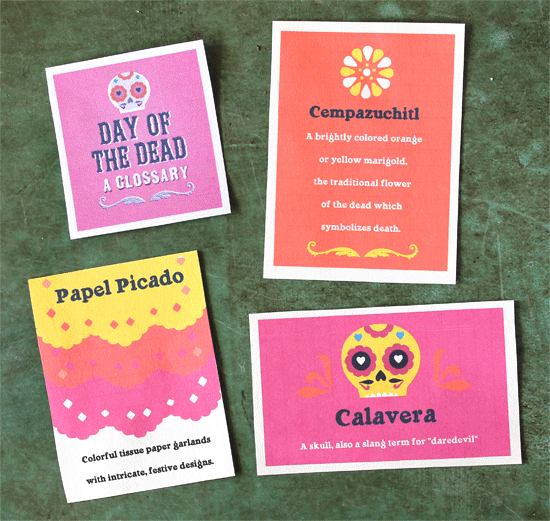 Glossary printables for parties and fiestas! 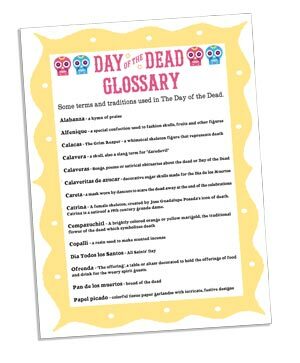 Download this free printable glossary for guests at a party or for students in the classroom to introduce a few key phrases about Mexican el Dia de los Muertos or Day of the Dead. Dia de los Muertos terms and traditions used on and around the famous and colourful Mexican festival. Calacas – The Grim Reaper – a whimsical skeleton figure that represents death. Calaveras – Songs, poems or satirical obituaries about the dead or Day of the Dead. Catrina – A female skeleton, created by Jose Guadalupe Posada’s icon of death. Catrina is a satire of a 19th century grande dame. Cempazuchitl – A brightly colored orange or yellow marigold, the traditional flower of the dead which symbolizes death. Copalli – a resin used to make scented incense. Ofrenda – “The offering”, a table or altar decorated to hold the offerings of food and drink for the weary spirit guests. See Happythought paper craft ofrenda! Papel picado – colourful tissue or crepe paper garlands with intricate, festive designs. Video tutorial + photo tutorial. What is a Calavera, oferenda, catrina? Dia de los Muertos terms + traditions! Need ideas for this years Day of the Dead? 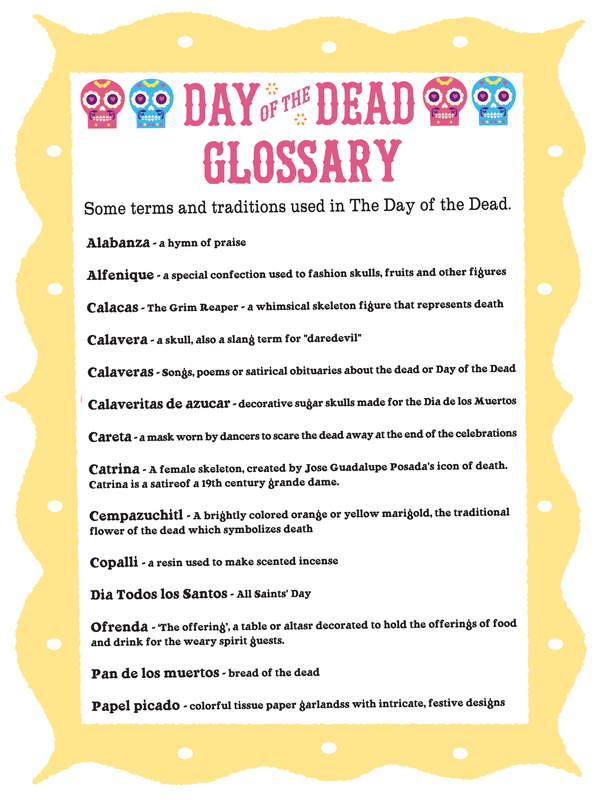 We hope you enjoyed our Day of the Dead glossary printable! Good AM First your site is amazing. I am on a very tight budget and your pieces have made our party. One question. The Day of the Dead Glossary has the Bingo Game attached, not the pictures above of the Glossary. I am using this party as an educational opportunity for my daughters 1st grade class. Could you send over the correct file please??? Your site is awesome! I will definitely be using some of these ideas this week while I student teach! Thanks for sharing some of the downloads! Is there anyway to get/buy the examples pictured above? The signs in the photo are included in our Dia de los Muertos Printable kit. Thanks again, glad you liked the printables.